Another dark day in America is upon us, another day where I can't possibly bring myself to wrote about what I had planned to write about here, because it seems insanely trivial to talk about fashion, amazing decor hacks or our favorite recipes this week. At last count 59 people were murdered and hundreds shot if the middle of a concert in Las Vegas. How can we continue to function normally after a massacre like this? Scrolling through social media is such a surreal thing on days as devastating as these, you are either seeing people who are expressing exactly what you are feeling inside or you want to scream at the trivial garbage that shows up in your feed... "No one cares about your tummy tea today Janet!" Overwhelmingly one of the main things we have seen is an outpouring of love, hurt, questioning why and HOW this tragic event was able to take place. There is an overwhelming cry for GUN SENSE in our country..... Yep, we are rejoining the phrase... So don't come crying g here about GUN CONTROL.... You want to keep your hand gun? You just NEED to have your shot gun because you have to go shoot helpless deer in the woods? Sure, if that makes you feel like more of a man or an American that's your right. But absolutely NO ONE needs a gun that can do this damage. I dare you to argue otherwise. One of the main problems getting our feelings heard is that so much of our congress is owned by the NRA - Our president is very likely deeply tied to the organization, and not for his moral beliefs, I would be hard pressed to find one deeply grounded moral or belief in that man, he is deeply tied in for MONEY. Yep, the NRA contributes millions of dollars to put people in office who will vote their way. "Guns exist for the sole purpose of killing, and they’ll continue to devastate our families and communities until we dramatically limit their availability. Unfortunately, the National Rifle Association has spent millions of dollars advancing its guns everywhere agenda, buying off members of Congress, and spreading lies about gun reform. In 2016, the lobby invested over $30 million to elect Donald Trump and spent another $20 million electing gun extremists to Congress. " This is information from Guns Down America, we recommend you follow them on twitter. Guns Down America is following the money and calling people out. For every tweet about a State Representatives "Thoughts & Prayers" for the victims of Las Vegas, they have the amount the NRA contributed to their campaign. You have never seen anything as disgusting. 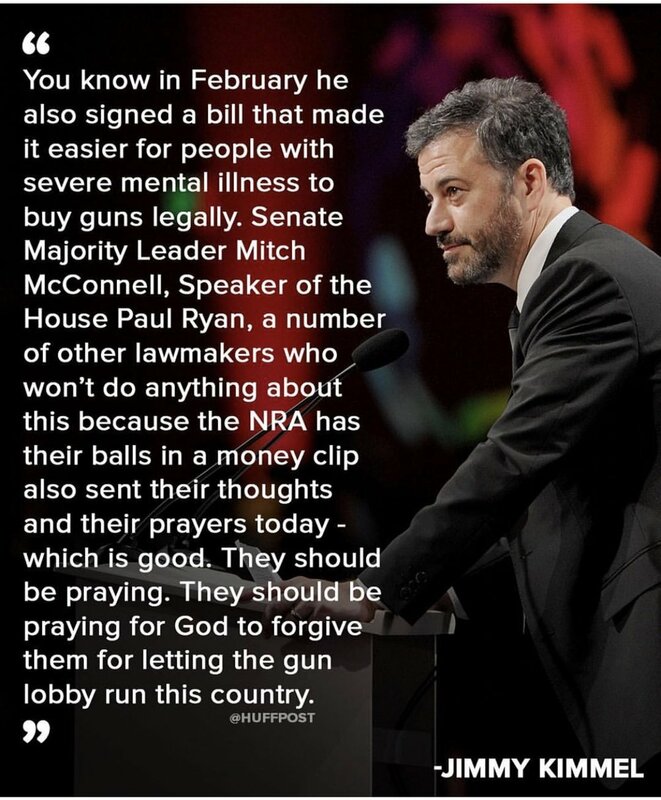 Jimmy Kimmel, who has taken his platform and voice and become a representative for ALL OF US, he speaks the truth on television to millions of people and we hear him! Yes, maybe people can say, what right does a comedian and late night talk show host have speaking about anything political. Well, most of the people who say that voted for a game show host who has been the punchline of jokes in America since I was a little girl.... So. If you are looking for ways to speak up, and we know so many of you are. Here are a few ways to have your voice heard and hopefully help lead America into the right direction so we never have to wake up to news like this again. It has happened to many times in our lives, and whats worse, too many times in our children's lives to just stand by. Urge your representatives to find a compromise, to introduce legislation, to return the campaign donations they received from the NRA. Let them know that as an American, as a Mother, Father, Sister, Brother, Son, Daughter that you believe there is no practical reason for anyone to possess high-capacity magazines. We are not alone in this. We DO have people in our country fighting the good fight for us. We need to shine the light on those people, we need to organize and register and VOTE. We need to take our country back from the narrow minded agenda of the NRA and all those that can't see that a compromise can be reached. Thank you Sen. Chris Murphy for speaking up and calling out our Congress. You have our support. Thank you Rep. John Lewis, for all you do and your long fight to stand up for America. Thank you Cory Booker for standing for Gun Reform and calling people out on their actions, not just their words. Stay safe, I hope we never have to wake up to this news again. Fight the good fight, we are with you. And we can't close out this day without a tribute to the beautifully talented and gifted musician Tom Petty who passed away last night. For most of our lives this man's music was woven into the background. Songs that will forever remind us of being young, being free and feeling the beauty that is all around us. 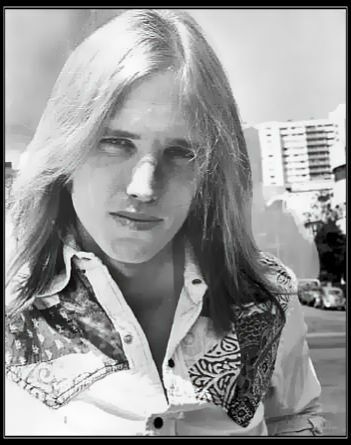 Thank you Tom Petty for being the definition of American Rock & Roll.